Teenage parenthood, particularly when the mother is under 18, is known to increase risk and poor outcomes for their children. In "Promises I Can Keep: Why Poor Women Put Motherhood Before Marriage," Kathryn Edin and Maria Kefalas report the findings of their two-and-a-half year field study of 162 young, unmarried mothers living in Philadelphia's blighted urban neighborhoods. Although considerable research has been devoted to understanding the dramatic increase in non-marital child bearing among young women in low-income communities, Edin and Kefalas saw that the "perspectives and life experiences" of low-income single mothers were mostly absent from the body of scientific evidence. In the course of their interviews and interactions with the women in their study, Edin and Kefalas found that low-income teenagers do, in fact, "knowingly" become pregnant, and many consider early, out-of-wedlock child-bearing as not only a valid life option, but a mature and responsible choice. "To most middle class observers, depending on their philosophical take on things, a poor woman with children but no husband, diploma or job is either a victim of her circumstances or undeniable proof that American society is coming apart at the seams," the authors write. "But in the social world inhabited by poor women, a baby born into such conditions represents an opportunity to prove one's worth." While the poor women they studied perceive marriage as a "luxury" -- "something they aspired to but feared they might never achieve" -- having children is viewed as a necessity, "an absolutely essential part of a young woman's life, the chief source of identity and meaning." And while the exclusive rhetoric of Single Mothers by Choice identifies the ideal single mother as a woman who has "completed college," and is "able to support a child without recourse to public funds," the young women in "Promises I Can Keep" express a high degree of confidence in their ability to be excellent mothers despite their disadvantaged circumstances. The lower dog is the mother, the upper, her son. I took the photos used outside my shop. She was very camera shy and it was impossible to get a shot with them posed together so I treated them as individual (but combined) portraits. Lovely temperaments. Gordon Campbell has written a piece called 10 myths about welfare. Some of it is accurate; some is not. The vast majority of people want to work. The history of the last ten years in particular shows that when jobs exist, people work. The "history of the last ten years" shows almost the opposite. During the economic boom numbers on the DPB dropped by a maximum of 15 percent and numbers on the sickness and invalid benefits continued to grow. Only the dole total dropped significantly. In fact, only 3.1 % of those on the DPB are under 20 years of age – and that figure has barely flickered since 2005, when the figure was 2.9 %. Put another way, 97% of the people on the DPB are NOT the ‘very young women’ of Key’s lurid imagination. There are in fact, significantly more people on the DPB over 55 years of age (5.6%) than there are ‘very young women’ receiving this benefit." Campbell repeats a widespread misunderstanding here. If Key's assertion is correct then we would expect to see exactly the kind of percentages Campbell describes. When people stay on welfare a long time they progressively appear in older age bands. The most important fact is that at least a third of current sole parents became parents as teenagers. 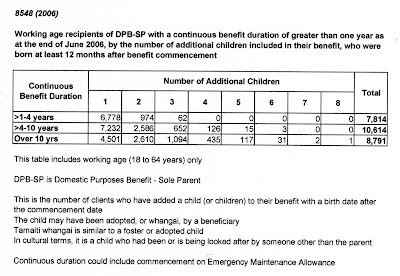 I have shown that probably around a half of the DPB population first began on welfare as a teenager. The current age of a DPB recipient is irrelevant. "...more DPB recipients are engaged in part-time work (16%) than those on the dole." This claim is based on the DPB fact sheet showing 15.7 percent of recipients have 'declared earnings' for the year. It does not necessarily mean that they are currently working. Most of the people on welfare are unmarried mothers – many of them teenagers – who have extra children so that they can get more money. Not most. But 27,219 is significant. Certainly the public perception is grounded in reality. Lots of people are on welfare for years and years, and then their children and grandchildren become welfare dependent. This myth is based on stereotypes about the chronically shiftless and teemingly fertile poor. Lets stick with the DPB for a moment. Since the DPB involves the care of children who are dependent at least until they are 18, you’d think it would reflect lifetime dependency very strongly. 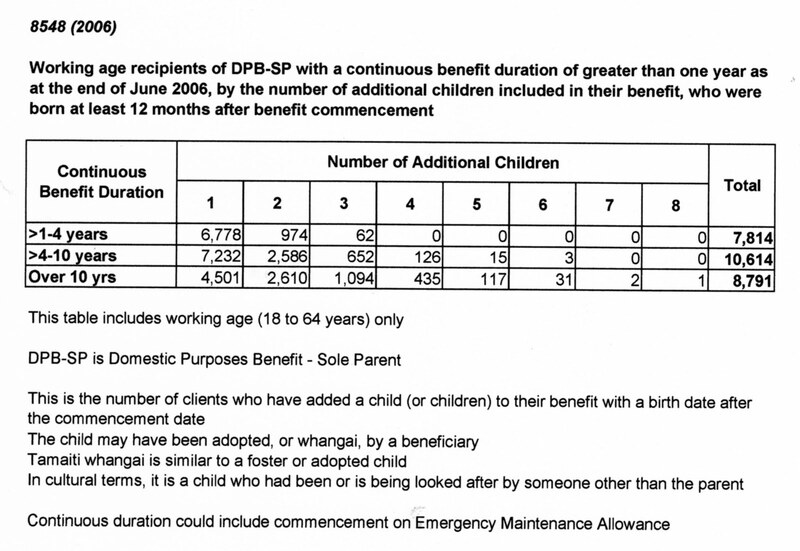 Yet instead, over two thirds of DPB recipients (67.7%) are on the DPB for less than four years. More than a quarter of them (26%) are on it for less than a year, even during the recession. If this is a lifestyle choice, it is hardly a fashionable one. Inter-generational dependence is a proven phenomenon. Academic research provides evidence. Some part of it works through the much higher likelihood that a teenage parent will have a daughter who also becomes a teenage parent. Additionally it occurs because of the transmission of attitudes towards welfare. Young people need welfare reform in order to teach them the value of work. Far from being a myth young people do need to grow up with at least one working parent to understand the value of work. Building an expectation of independence is probably one of the most important goals of reforming the DPB especially. The current rate of Maori unemployment is a catastrophic 36.7%. This claim was not intended to be a "myth" but ironically, it is. The Maori rate of unemployment in December 2010 was 15.5 percent. People are usually in hardship for economic reasons, and not due to a lack of moral fibre. The churn of jobs and the likelihood of multiple careers in one’s working life – ie the labour ‘flexibility’ so beloved by Treasury and its corporate friends – means that it is more and more likely that at any given time in their working lives, more people (and their children and grandchildren ) will be at risk of needing temporary welfare assistance during thedir job transitions. Granted people are in hardship for economic reasons but also because of personal choices they make. Go back to the MSD quote. Is the economy to be held responsible for a teenage birth that results in many years reliant on a benefit? Could boot camps increase the risk of re-offending? The re-imprisonment rate over 48 months for Maori offenders (55%) is considerably higher than the rate for both NZ Europeans (45%) and Pacific offenders (36%). This difference is likely to be a reflection of a number of variables. Maori offenders as a group tend on average to be younger than Europeans (see Appendix 1). Maori are also more likely to be serving time for offences which have base-rates, especially dishonesty offences (burglary, car conversion, theft, etc) 4. Pacific offenders on the other hand tend to be in prison for offences which have relatively low base rates (violence and sexual offences). Although the high re-imprisonment rate for Maori undoubtedly contributes to the disproportionate number of Maori in prison, its impact is likely to be considerably less than that of the very large numbers of young Maori entering the criminal justice system for the first time each year. Without knowing anything specific about the small sample that has undergone boot camp 'rehab' there is a reasonable question to be posed. Does it increase the risk of re-offending? I don't mind being called stupid when I am. My family calls me stupid when I (re) heat the just-delivered Hell's Pizza salad along with the pizza or when I boil chillies instead of green beans and then make the gravy from the resulting vegetable water. Yes. I can be stupid. But I don't take kindly to being called stupid over stating an opinion which is based on my own experiences as a volunteer, listening and looking, research and reading. But perhaps I should be humbled that an academic completing a thesis can spare me the time. I want to talk about Lindsay Mitchell and Dr. Paul Moon, both of whom have said some remarkably stupid things in the last few days. Moon really has no excuse for his ill-considered comments; Mitchell probably just doesn’t know better. Let’s start with her.